Every once in a while I find a product that I think will be a “game changer” for the Wildlife Control Industry. There has been a lot of progress in the last 25 years and it seems that the industry is finally starting to come out of the stone ages. Looking back, I can think of a few things that have really changed the way we do business. Way back in the day, the best way to get a raccoon out of a chimney was to chase it up the chimney while an assistant waits on the roof with a catchpole. Richard Daniotti Jr. came up with a game changing idea when he produced his Chim-trap. After this idea, the raccoon in the chimney call became an easy one-man operation. We use multi-purpose traps on a daily basis. These traps can be set over holes in the ground, abutting holes and entryways in buildings, on top of chimneys, or simply used ad a traditional cage trap. This on trap now takes the place of many traps that used to be specialty traps. Real estate in the truck bed is no longer at a premium. We have lots of space! Trail cameras have really improved as well. The cameras that we now use send us a picture, directly to our cell phone or our email address, whenever motion is detected. Many times we know about an animal that’s in the trap well before the client knows! These cameras have helped us a lot and have given us knowledge in certain situations that would have been hard to obtain otherwise. Another huge improvement in out industry is the use of thermal imaging. Animals that are hiding in rooms now glow red and there is virtually no place that we can’t see them. This is a relatively new innovation for the wildlife control industry and prices are well within the range or everyone’s budget. The tools that I mention above are what I consider game changers. They have absolutely changed the way we do business. Ive recently discovered another tool that is going to be huge! If you do any bat work, mouse work, flying squirrel work or even red or fox squirrel work, this product will make you start loving working on ridge vents again. The days of doing ride vent tear offs are gone folks. Gone are the days where we cram cobra-vent into the gaps of a ride vent. The days are over where we HOPE that the cheap plastic ridge vents don’t buckle under the hot sun and create a gap that will cause us a call-back on a bat exclusion. The ends of the ridge vent can be tricky to seal, but Ridge-Guard® makes that fairly simple as well. Using just a regular piece of the Ridge-Guard® material, you simply make a couple of cuts where the angle of the roof changes. 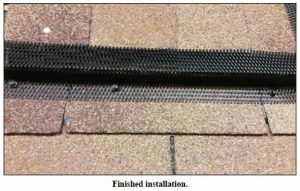 These cuts allow you to bend the Ridge-Guard® into shape at the end of the ridge vent and then it is secured by screwing in down just like the straight pieces. 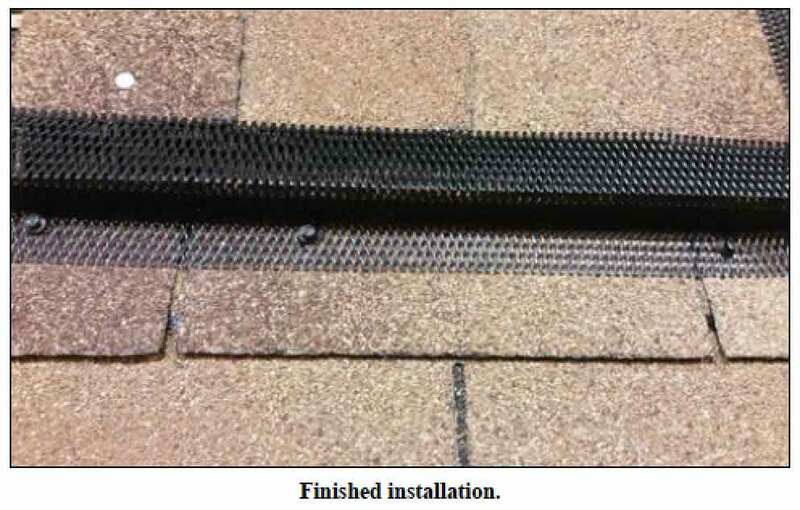 The top of the Ridge-Guard® is not screwed down into the ridge vent shingles or secured in any manner really. The tension from the bend is all that is needed to make it lay flat while it is applying downward tension. 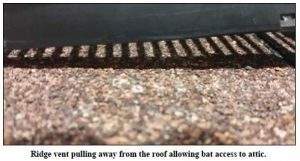 Here is the only drawback that I find with the Ridge-Guard®. The screws that are supplied (currently 250 per package) are standard steel roofing type screws, painted and with a neoprene washer. The manufacturer instructs us to tighten the screw and washer through the Ridge-Guard® into the shingles below and on into the wooden roof sheathing. This is where I get a tad skeptical, as the only way that the neoprene washer will be self-sealing as intended is if it is snug against and covering the new hole that we just put into our client’s roof. Placing the washer below the Ridge-Guard® and screwing through the gaps of the Ridge-Guard® will assure that water will not seep in. By having the washer on top of the Ridge-Guard® material, we are increasing the surface pressure places by the screw head, but leaving just a bit of the screw threads potentially exposed to the elements. I suppose that this potential could be tackled by dabbing just a bit of sealant into the threads before you screw it into the roof. What you price this product out to your clients is your business, and certainly reliant on your location and the marketplace’s well-being. When speaking with a Ridge-Guard® sales representative, I speculated at $6.00 per linear foot at a ballpark selling price for our clients. He told me that personally he charges a half a buck more per foot, but his market may be a bit better off than mine. At $6.00 per foot installed, you are making about 50% more on the product than its original cost – not a bad return when you consider the ease of installation. One tube of Ridge-Guard® contains twenty sections (eight feet each). This should be enough Ridge-Guard® to do two or three standard homes. Remember when estimating these jobs, each ridge vent has two sides! Each side will have to have its own section of Ridge-Guard®. When quoting prices on and roof work, roof pitch always comes into play. Obviously, we’d all like to work on a nice friendly 4/12 pitched roof, but that isn’t always the case! As the roof pitch increases, so do my fees. I call it the pucker factor. If we’re going to have to worry about a 10/12 pitch, the associated dangers and precautionary measures must be taken into account. Charging $10 per foot is certainly not out of the question on a job like this. Basically, anything steeper than a 4/12 pitch should warrant some extra cost. Would an 8/12 pitch roof warrant $8.00 per foot? I think so and am confident that I can sell it. Nobody likes heights. Just because you can scale a roof like a monkey doesn’t mean that everyone can. Charge appropriately. 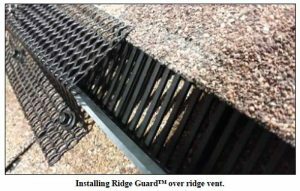 Ridge-Guard® is certainly another one of our industry game changers. New products like this don’t come along very often. I know that I’ll be very glad that this one arrived for us when it did – not a moment too soon. This article has been reprinted here with permission. It originally appeared in WCT Magazine in the March / April 2017 issue.